Fire Pumps – Sebench Engineering, Inc.
Hydraulically calculate all fire pump, suppression and hose demands. Fire pumps are often required to boost the flow and pressure of water to sprinkler systems, and internal hydrants for firefighting. Fitting large fire pump enclosures into existing facilities can be especially challenging. 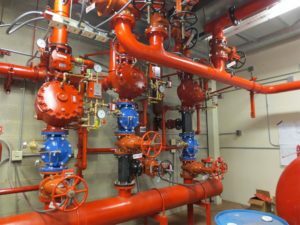 The design of any fire pump must consider not only the demands of the protection, but the limitations of access and working space presented by the particular jobsite. Sebench has worked successfully on a number of installations where space is at a premium. The complex hydraulic demands of multiple fire pumps also requires special skill in evaluating existing conditions and designing new sources of fire water. Sebench has years of experience in designing such fire pump installations. Our working relationship with a major pump manufacturer also provides excellent purchasing power for our clients needing either electric or diesel fire pump installations.